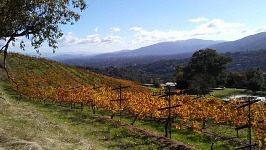 A Saturday return from Europe meant that we had Sunday to gather our senses. Kids are altogether flexible and bouncy, but I, an old person, simply suffer. I tried a whole bunch of advice how to deal with jet lag, but somehow nothing seems to work convincingly. 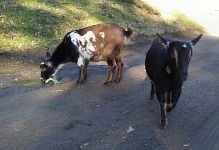 Still, there was no time for whining; I had to go see my goaties. Here, I would like to correct my own statement. Goats are NOT quite indifferent if you leave them for a longer time. For a few first days, they elegantly ignored me, and then they began to be obnoxious. All respect and balance between us had disappeared, cooperation replaced by grumpy back-talk. This was escalated by my arranging with Rachel to take home her baby goats. It began to be tight in the small pen, and their relationships got edgy. Twilight got pushed into a position of a lonely goat, for the babies stuck with their mother, Licorice. Berry has grown up and began to challenge Twilight's status of alpha goat. And they all together agreed to leave Star in the lowest goat rank, and we had to keep an eye on her getting enough to eat. Simply put, time had come to move the young goats to their own home. The actual move proceeded with much screaming of all goats. Berry and Star got a bit quieter only after finding themselves in their new location. Thus I gain a worry with milking Licorice. I don't know if I got more skillful, or if Licorice is a less of a drama goat, or if she as a beta does not dwell so much on dignity, but it turned out to be a bit easier with her than with Twilight. Still, she has a lot less milk — and again I don't know, if it's because she's a smaller goat, or because she was getting ready to wean Star off anyway. Lisa has to train her own pony. Meanwhile, Lisa started vaulting again. Last year she missed team try-outs because of her accident, and thus for the rest of the year after having healed her broken bones, she attended at a recreational pace. This was fine, but it would not advance her much; Lisa expressed a wish to do vaulting properly. 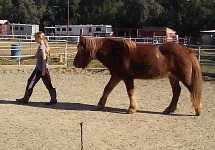 We talked it over with the trainer, Ashley, and enrolled Lisa into preliminary trot. Training was planned mercifully to Wednesdays, once a week, super easy. This way, though, Lisa became a member of Mt. Eden Vaulting Club, and we began receiving papers and surveys and applications — and also a memo that the first competition takes place already on October twenty eighth. It has complicated my situation mostly because I had a surgery planned for the nineteenth, and I had to organize, fill out and pay everything within the remaining five days, for I did not know how mobile and lucid I would be after the surgery. My doctor was threatening with six weeks of indisposition and stressed repeatedly that for those three fortnights I must not engage in any physical activity, not even yoga. And since I have my experience with probably being a weaker individual, and my convalescence lasts much longer than optimistic outlooks of doctors, I wanted to be ready. During my last week before the surgery I was arranging people to milk my goat, for Rachel was to be away just this one week, I tried to understand all administrative tangles of the vaulting team, then I had to see an optometrist on account of running out of contact lenses, and was still haunted by summons to pre-surgery tests. Those would get me raging every time a nurse would call me that I still have to go to get yet another test. As if they could not give me a COMPLETE LSIT UPFRONT, during that one-hour meeting with the surgery team! Why did I have to go to my PCP (with a waiting room full of sniveling, coughing wrecks) in a hurry three days before my surgery, and why did I get another call twelve hours before day D, and got asked to drop everything and go to a lab to get a pregnancy test — into the same lab that I visited three times during the week leading to this moment? By that time, I was rather hysterical and did not go to get any more tests. I had a long list of what needed to get ready at home, and I could not just abandon it, because someone is incompetent. Up to three girls from one team may be up on a horse at a time. The PCP visit was in the end the most positive one of them all — she had figured out why my throat had hurt so much after my last surgery: intubation. Apparently I own a set of "narrow tubes", which would explain my never-ending issues with ears and sinuses — thus I could plan with an anesthesiologist to get me smaller tubes. Subsequently, there were no problems with that after I came back. The surgery was a much worse matter — the fact that I could not in any way apply pressure to my belly meant that I was reduced to laying flat or standing up for relatively many weeks. Two rounds of antibiotics did not help much either. I left the hospital on the same day afternoon — I was ready to catch up with my breakfast (naturally, I had to show up hungry in the morning) and get a real coffee, not a hospital supper. I was able to perform basic life functions without assistance and there are no angry beeping instruments at home. Just so you know, when all the instruments began screaming around me (although there was nothing wrong with me) and nobody would bother to come down and turn them off, I did not think I missed any professional care at home. And there was less stress — when a nurse shuffled in about ten minutes after I called her on the phone regarding the screaming instruments, she berated me that the instruments were screaming because I was covering my ears (after anesthesia I had enough head-ache without the help of siren). I pointed out that her logic was reversed — I was covering my ears as a consequence of screaming instruments, not the other way around. She ignored me and departed, pissed off. On the fifth day after surgery I declared my goats to be therapeutic, and ventured on a visit. Sarah was milking; I exhausted my available range of positions by driving while sitting down, but I felt it getting better. In whole two more days I took over milking, and when I just shuffled, I managed to get out of the house at least once daily. Goaties were again expressing a mild disapproval with the rotation of their service team, and it was by far not as pronounced as with the two-week absence. Sarah has had Nigerian goats for years and know s how to handle them, and that made it was probably easier on them. All the staff at the stables were very understanding and really helped with harder tasks — took over carrying buckets, cleaning the enclosure, and similar harder work. Tom pulling a cart to the line-up and Lisa is being a ballast. 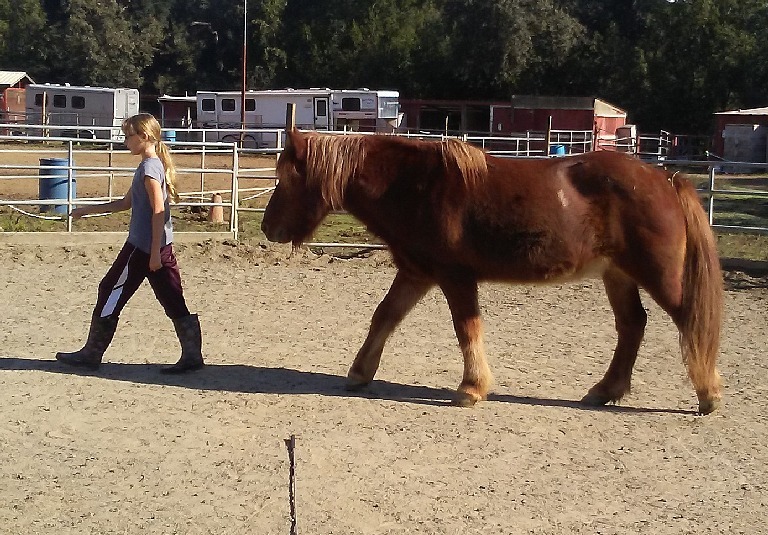 Lisa took over responsibility for care of Ljufur the pony. I was just about able to drive her there, but she had to deal with her pony on her own. For one visit, I had arranged a trainer to have someone to watch them, but otherwise Lisa was her own boss. 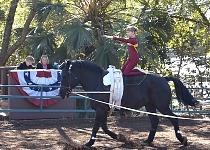 This is great — the fact that she had reached an age when I can leave her alone with her horse and I don't have to hover. I wonder how much Ljufi remembers Lisa from the time six years ago — it seems to me that he's treating her much better than other children, and certainly better than adults. Or they have simply found each other and their natures match so much there are is no friction. 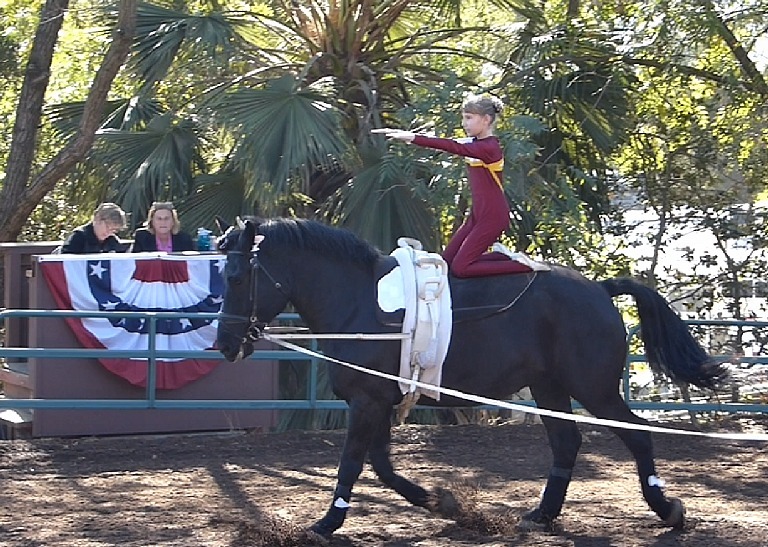 Nine days after my surgery, Lisa had her first vaulting competition. She took it very seriously, as she was also supposed go through technical tests. The club also took it very seriously — operation of such demanding sport depends on volunteers, for the few dollars of registration fee would surely not pay for the infrastructure of several clubs, tens of competitors and their horses. Every family was thus to provide one volunteer, which I solved in the end by offering Tom, for I was not sure yet how much I could take. And I also wanted Tom to go see Lisa competing, and such thing is always more comfortably done when one is part of the doing, and is given a function or a task, instead of aimlessly dithering around — it was clear that Lisa's performance would take generally minutes at most, and the rest would be miscellaneous standing around. The competitions took a whole day, beginning at six a.m. We were lucky, Lisa's group was scheduled for eleven o'clock, and on account of warming up and general preparations, Sid took her there ninety minutes earlier. Meanwhile I milked my goats, picked up Tom, and we made it just so. To my surprise and Lisa's great joy, her friend Lucy and her mother came too. I had some doubts what would Lisa be able to present after three weeks of practicing, although she was only to do compulsories. Yet Lisa showed up in a team dress, with a professional hairstyle and a focused demeanor of a responsible artist. 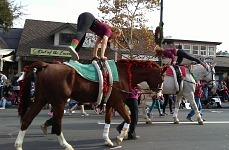 I don't understand vaulting at all, but Lisa looked best among their beginners' group. And I may not have been the only one who noticed, for afterwards coaches came to us with an offer to switch Lisa to a trot team. Well, Lisa would want that very much. I got a bit dizzy imagining fees for two trainings a week. And the second one would be on Sundays, which would considerably interfere with our weekend plans. ...girls discussing and practicing moves. But, we had not noticed anything similar with Lisa, in the manner of this level of enthusiasm for any other sports; she's in the age where it certainly would not harm doing some exercise, or having less time to do silly things. We agreed with the coach that Lisa may sometimes skip a training, and it turned out that the club mercifully observes school breaks (we know from our friends that for some sports, school breaks induce two-phase mandatory trainings), during which only elective hours are held, and anybody can attend who has currently time to test their things. So we did sign up in the end — Lisa had to catch up by the start of August, for the nationals — as now she became a member of a seven-girl team. A team also means additional investments, such as sweat sets, and later performance costumes. Again we hope that the pay-back will take another form. For example, now that she exercises more, Lisa began to have feelings of hunger, and started eating more. She stretches without talking back, and has some motivation for finishing homework in time. She's the oldest and tallest in the team, riding the "base" — thanks to a relatively large horse-riding experience, Lisa has a real feel for the horse's rhythm, and it makes sense for her to be the person between the horse and the flying acrobats — as she sits well. At home with us, Lisa has been on the tail end — youngest, smallest, weakest and so on. A role of the oldest, most sensible and responsible does her certainly well, and it's surely nice to try it all from the other side of things. 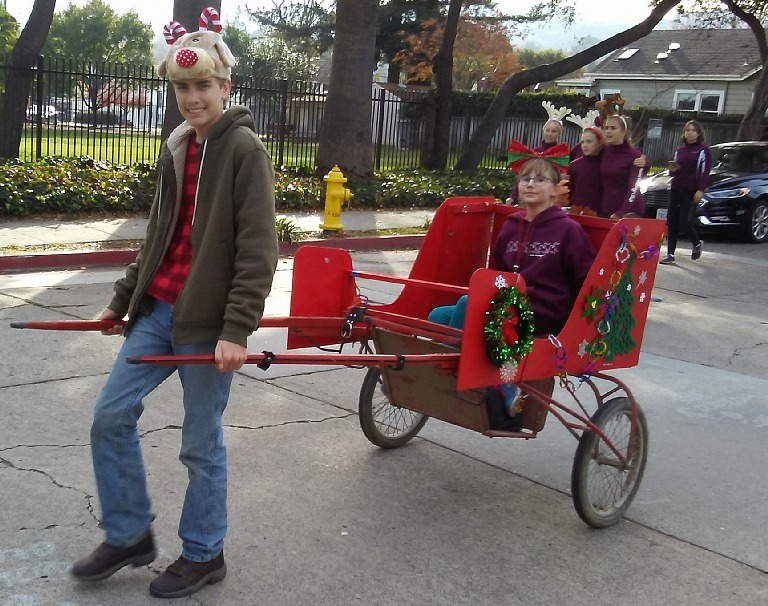 With the end of my convalescence, the annual Christmas Parade in Los Gatos approached. It was clear this year that we had to participate — Lisa wanted to go with Mt. 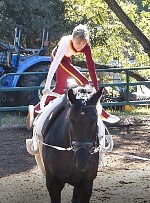 Eden Vaulting Club, and Tom and I thought to go with the Bear Creek crew. 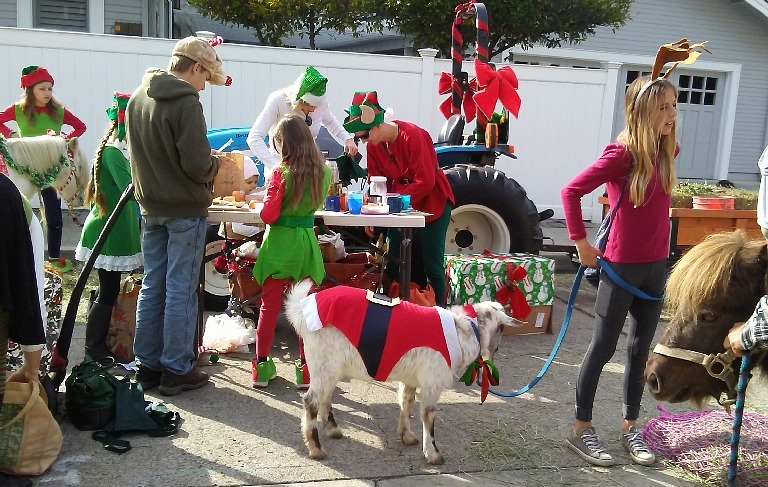 No goats of ours this time — they give milk, and stressing them with the parade did not seem healthy — and I did not feel like risking the whole purpose of my surgery by arguing with a buckling goat. I wanted to enjoy it for once from the careless side. Ergo I got up at six thirty, rushed off to milk the goats, and by eight thirty met with my family at a parking lot where groups converged with horses and other beasts. Subsequently I oscillated between decorating Mt. 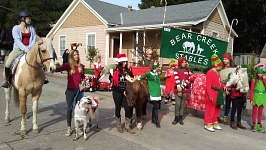 Eden float and a tractor and beasts of Bear Creek, arranging things with two divergent groups of people. Lisa has reached the stage where she could do quite well with not having any mother, much less this publicly, and so I could leave her more or less be. Vaulting company included a larger quantity of adults and near-adults, and thus appeared closer to being under control, unlike the very diverse cluster of Bear Creek, including small children with a pony, a miniature horese with a cart, a tractor, a more grown-up miss on a horse, another more grown-up miss with a goat (wether Marshmallow), and a hard to track number of picnic carts with refreshments and food for all participants, who needed transforming into elves and Christmas-themed characters. Tom and I solved the question of a constume with hats in the shape of reindeer heads, keeping our jeans and fleeces — I worried that hugging elf leggings might induce an impression in the audience of me trying to impersonate a menopausal hippie, as opposed to Santa's wintertime helper. 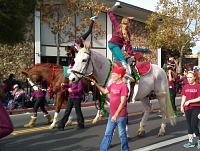 At half past nine, a police patrol picked us up and accompanied us across town to the line-up area for the parade. 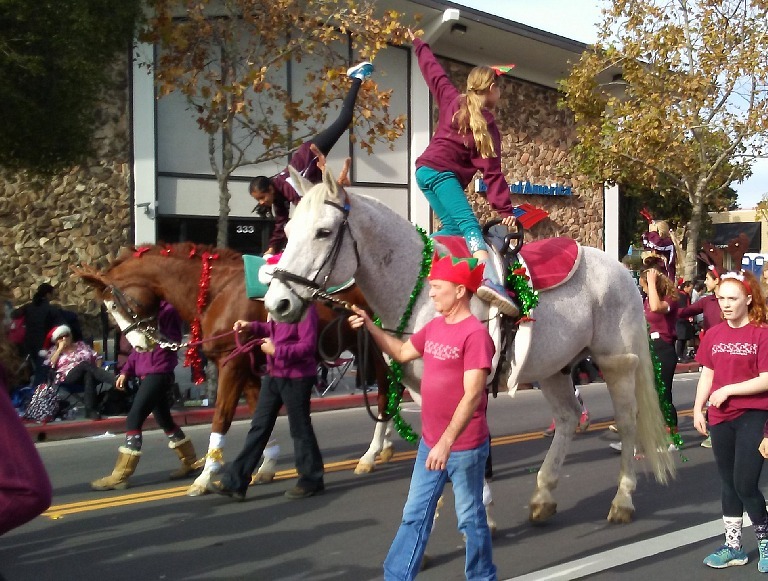 Fortunately because both groups had horses, they were supposed to join the parade close together (horses go towards the end, right before Santa Claus), and thus bordered on each other at the line-up. 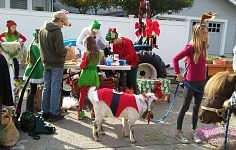 Tom was a bit bored, and fed on the food stores and played with Marshie (the goat). Lisa spent the three hours waiting for the parade by training tricks with other girls in the club. I still don't know where they got the energy for it. At some point, the coach sorted them in a line from shortest to tallest, turning them around and pairing them — so that each big girl matched with a small one, while medium girls matched together. Lisa, as one of the small ones, was matched with a much older and experienced Bodhi. The pairs immediately began to plan their moves on a barrel — and I realized that I simply could not go with Bear Creek; this I had to see. I anticipated that in the parade, the barrel would ride on a car, and the girls would lead their decorated horses, waving to the crowds. I was quite wrong. 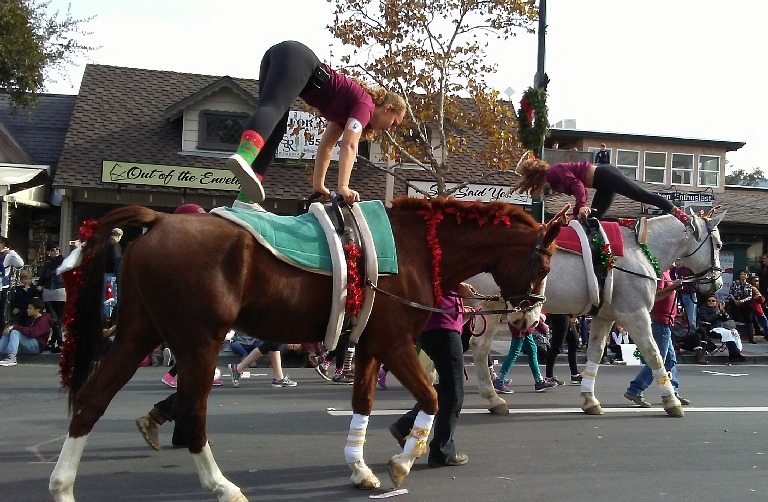 Barrel indeed rode on a truck, and newly formed doubles would in the course of the parade jump up on the car, perform on the barrel, jump off, file back in among the horses, perform on one horse, jump off, perform on the other horse, and repeat all this again and again. 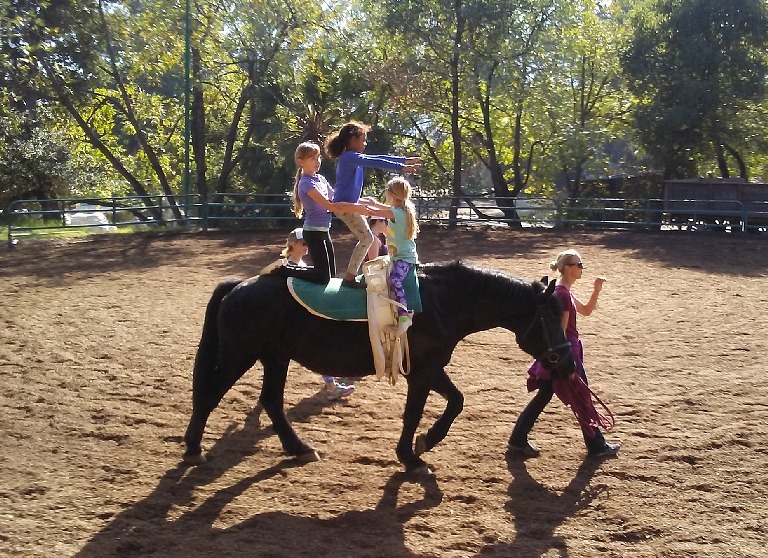 Girls who found themselves momentarily neither on a horse nor on a barrel, were throwing cartwheels, walked on their hands, carried each other on their shoulders and tossed each other into the air. It had an air of a circus coming to town. So I tried to take pictures. A few times, I returned to Tom, so he would not be all alone amongst little stable girls, but I'm not sure how much it helped. 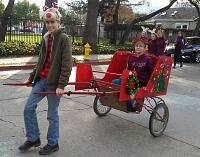 Next time I won't urge him to go to the parade, as he's becoming more and more of a teenager. 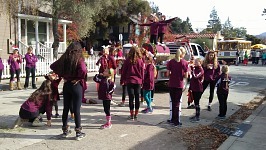 But the day did not end with the parade. I had planned to keep it secret from Lisa, but the club had a Christmas party in the afternoon, but I practically had no chance. Hence we had to go to the party. It was, fortunately, very merciful. Everybody brought some food or drinks, the stables where the club is nested, provided own wine (as it's also a winery), and a late lunch was followed by announcement of trial results and presents raffle (everybody was supposed to bring a small gift) — and we could go home. Still it was already five thirty by the time we arrived. 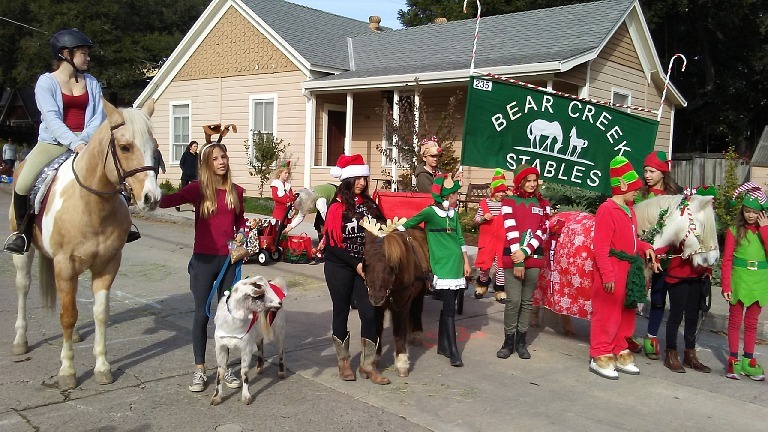 A super long day — and though I swear every year that never again, and although I had a perfect excuse in my convalescence, and although I actually "did nothing" in the parade, I was tired like a dog. But I'm afraid that next time we'll go again. Copyright © 2017-2018 by Carol & Sid Paral. All rights reserved.